The Niue Constitution Act vests executive authority in Her Majesty the Queen in Right of New Zealand and the Governor-General of New Zealand. The Constitution specifies that in everyday practice sovereignty is exercised by the Niue Cabinet of Ministers, consisting of the premier and three other ministers. The premier and ministers are members of the Niue Legislative Assembly, the nation's parliament. The assembly consists of 20 democratically elected members, 14 of whom are elected by the electors of each village constituency, six by all registered voters in all constituencies. Electors must be New Zealand citizens, resident for at least three months, and candidates must be electors and resident for 12 months. Anyone born in Niue must register on the electoral roll. If two candidates have the same number of votes, the votes are recounted; if the number of votes is still equal, the name of the winning candidate is drawn out of a hat. The Speaker is elected by the assembly and is the first official to be elected in the first sitting of the Legislative Assembly following an election. The new Speaker calls for nominations for premier; the candidate with the most votes from the 20 members is elected. The Premier selects three other members to form the Cabinet of Ministers, the executive arm of government. The other two organs of government, following the Westminster model, are the Legislative Assembly and the Judiciary. General elections take place every three years, most recently on 7 June 2008. Niue is a 269 km² island in the southern Pacific Ocean, east of Tonga. The geographic coordinates are 19°03'48?S 169°52'11?W. 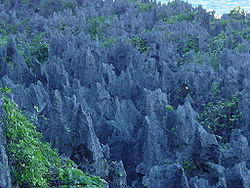 Niue is one of the world's largest coral islands. 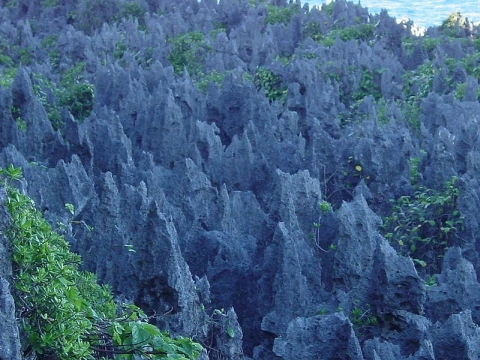 The terrain consists of steep limestone cliffs along the coast with a central plateau rising to about 60 metres above sea level. A coral reef surrounds the island, with the only major break in the reef being in the central western coast, close to the capital, Alofi. The island is roughly oval in shape (with a diameter of about 18 kilometres), with two large bays indenting the western coast, Alofi Bay in the centre and Avatele Bay in the south. Between these is the promontory of Halagigie Point. A small peninsula, TePā Point (Blowhole Point), is close to the settlement of Avatele in the southwest. Most of the population resides close to the west coast, around the capital, and in the northwest. Some of the soils are geochemically very unusual. They are extremely highly weathered tropical soils, with high levels of iron and aluminium oxides (oxisol) and mercury, and they contain surprisingly high levels of natural radioactivity. There is almost no uranium, but the radionucleides Th-230 and Pa-231 head the decay chains. This is the same distribution of elements as found naturally on very deep seabeds, but the geochemical evidence suggests that the origin is extreme weathering of coral and brief sea submergence 120,000 years ago. Endothermal upwelling, by which mild natural volcanic heat draws deep seawater up through the porous coral, may also contribute. It is thought that rather similar radioactive soils may exist on Lifou and Mare (island) near New Caledonia, and Rennell in the Solomon Islands, but no other locations are known. Niue has been self-governing in free association with New Zealand since 3 September 1974 when the people endorsed the Constitution in a plebiscite. Niue is fully responsible for its internal affairs. Niue's position concerning its external relations is less clear cut. Section 6 of the Niue Constitution Act provides that: "Nothing in this Act or in the Constitution shall affect the responsibilities of Her Majesty the Queen in right of New Zealand for the external affairs and defence of Niue." Section 8 elaborates but still leaves the position unclear, providing "Effect shall be given to the provisions of sections 6 and 7 [concerning external affairs and defence and economic and administrative assistance respectively] of this Act, and to any other aspect of the relationship between New Zealand and Niue which may from time to time call for positive co-operation between New Zealand and Niue after consultation between the Prime Minister of New Zealand and the Premier of Niue, and in accordance with the policies of their respective Governments; and, if it appears desirable that any provision be made in the law of Niue to carry out these policies, that provision may be made in the manner prescribed in the Constitution, but not otherwise." The island has a representative mission in Wellington, New Zealand. Niue is also a member of the South Pacific Forum and a number of regional and international agencies. It is not a member of the United Nations, but is a state party to the United Nations Convention on the Law of the Sea, the United Nations Framework Convention on Climate Change and the Ottawa Treaty. Niue purported to establish diplomatic relations with the People's Republic of China on December 12, 2007. However, in light of its Constitution it is uncertain whether Niue had the capacity to enter diplomatic relations with any country. Traditionally, Niue's foreign relations and defence have been regarded as the responsibility of New Zealand, which has full diplomatic relations with China. Furthermore the Joint Communique signed by Niue and China is different in its treatment of the Taiwan question from that agreed by New Zealand and China. New Zealand "acknowledged" China's position on Taiwan but has never expressly agreed with it, but Niue "recognises that there is only one China in the world, the Government of the People's Republic of China is the sole legal government representing the whole of China and Taiwan is an inalienable part of the territory of China." Critics have asked whether Niueans can continue to benefit from free association with New Zealand and yet disregard New Zealand's advice and establish an independent foreign policy. Niue's economy is small, with a GDP of NZ$17 million in 2003, or US$10 million at purchasing power parity. Most economic activity revolves around the Government, as the Government was traditionally in charge of organising and managing the affairs of the new country since 1974. However, since the economy has reached a stage where state regulation may now give way to the private sector, there is an ongoing effort to develop the private sector. Following Cyclone Heta, the Government made a major commitment towards rehabilitating and developing the private sector. The Government allocated $1 million for the private sector, which was spent on helping businesses devastated by the cyclone, and on the construction of the Fonuakula Industrial Park. This industrial park is now completed and some businesses are already operating from it. 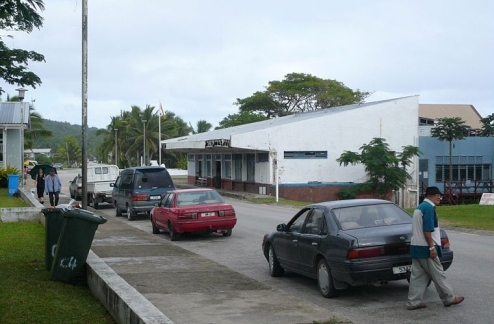 The Fonuakula Industrial Park is managed by the Niue Business Centre, a quasi-governmental organisation providing advisory services to businesses. Most Niuean families grow their own food crops for subsistence and some are sold at the Niue Makete in Alofi, some exported to their families in New Zealand. The Niuean taro is known in Samoa as Niue taro and in international markets as pink taro. Niue also exports taro to the New Zealand market. The Niue taro is a natural variety and is very resistant to pests. The Niue Government and the Reef Group from New Zealand started two joint ventures in 2003 and 2004 involving the development of the fisheries and noni (Morinda citrifolia, a small tree with edible fruit). The Niue Fish Processors, Ltd is a joint venture company processing fresh fish, mainly tuna (yellow fin, big eye and albacore), for export to the overseas markets. NFP operates out of their state-of-the-art fish plant in Amanau Alofi South, completed and opened in October 2004. In August 2005, an Australian mining company, Yamarna Goldfields, suggested that Niue might have the world's largest deposit of uranium. By early September these hopes were seen as overoptimistic, and in late October the company cancelled its plans to mine, announcing that exploration drilling had identified nothing of commercial value. The Australian Securities and Investments Commission filed charges in January 2007 against two directors of the company, now called Mining Projects Group Ltd, alleging that their conduct was deceptive and they engaged in insider trading. This case was settled out of court in July 2008, both sides withdrawing their claims. There is an Australian company that had been issued a mineral prospecting license in the early 1970s which is still very active in doing research and collecting data on potential mineral deposits on Niue. Remittances from Niuean expatriates were a major source of foreign exchange in the 1970s and early 1980s. The continuous migration of Niueans to New Zealand has shifted most members of nuclear and extended families to New Zealand, removing the need to send remittances back home. 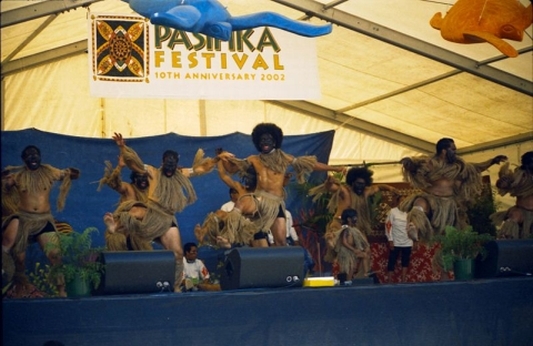 In the late 1990s PFTAC conducted studies on the Niue balance of payments, which confirmed that Niueans are receiving little remittances but are sending more monies overseas, mainly for paying for imported goods and for the education of Niuean students sent to study in New Zealand. Foreign aid, principally from New Zealand, has been the island's principal source of income. Government expenses consistently exceed revenue to a substantial degree, with aid from New Zealand subsidising public service payrolls. The government also generates some revenue, mainly from income tax, import tax and the lease of phone lines. The government briefly flirted with the creation of "offshore banking", but, under pressure from the US Treasury, agreed to end its support for schemes designed to minimise tax in countries like New Zealand. Niue now provides an automated Companies Registration (www.companies.gov.nu), which is administered by the New Zealand Ministry of Economic Development. The Niue Legislative Assembly passed the Niue Consumption Tax Act in the first week of February 2009, and the 12.5% tax on good and services is expected to come into effect on 1 April 2009. Income tax has been lowered, and import tax may be reset to zero except for "sin" items like tobacco, alcohol and soft drinks. Tax on secondary income has been lowered from 35% to 10%, with the stated goal of fostering increased labour productivity. 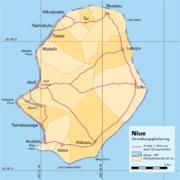 Niue has licensed the .nu top-level domain on the Internet to the private company .NU Domain. The Government later disputed the amount and type of compensation that Niue should receive from the licensor, but in 2007 the government dismissed its own claims. The Government is planning to set up and operate its own Internet service provider (ISP) to ensure that Government communications are independent and secure. The sole ISP in Niue is operated by the Internet Users Society of Niue (IUSN), a subsidiary of .NU Domain, which provides free Internet access to all residents. Despite claims by IUSN of Niue becoming the first WiFiNation, not all the villages in Niue have access to the Internet. In 2003 the Government made a commitment to develop and expand vanilla production with the support of NZAID. Vanilla has grown wild in Niue for a long time. Despite the setback caused by the devastation of Cyclone Heta in early 2004, there was ongoing work on vanilla production. The expansion plan started with the employment of unemployed or underemployed labour force to help clear land, plant supporting trees and plant vanilla vines. The approach to accessing land include having each household interested to have a small plot of around half to 1-acre (4,000 m²) to be cleared and planted with vanilla vines. There are a lot of planting material for supporting trees to meet demand for the expansion of vanilla plantations, however there is a severe shortage of vanilla vines for planting stock. There is of course the existing vanilla vines, but cutting them for planting stock will reduce or stop vanilla from producing beans. At the moment the focus is in the areas of harvesting and marketing. 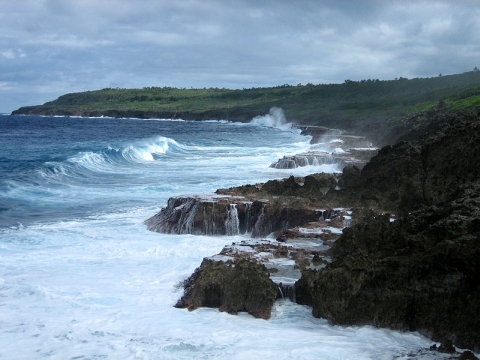 Niue's economy suffered from the devastating tropical Cyclone Heta on 4 January 2004. The Niue Integrated Strategic Plan (NISP) is the national development plan, setting national priorities for development. Cyclone Heta took away about two years from the implementation of the NISP, while national efforts concentrate on the recovery efforts. In 2008 Niue had yet to fully recover from the devastation of Cyclone Heta. Tourism has been identified as one of the three priority economic sectors (the other two are Fisheries and Agriculture) for economic development in Niue. In 2006, estimated visitor expenditure reached $1.6 million making Tourism a major export industry for Niue. Niue will continue to receive direct support from the Government and overseas donor agencies. Air New Zealand is the sole airline serving Niue, flying to Niue once a week. It took over after Polynesian Airlines stopped flying in November 2005. There is currently a tourism development strategy to increase the number of rooms available to overseas tourists at a sustainable level. Niue is also trying to attract foreign investors to invest in the tourism industry of Niue by offering import and company tax concessions as incentives. 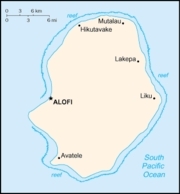 Niue has few media, due to its small size and population. It has two broadcast media outlets, Television Niue and Radio Sunshine, managed and operated by the Broadcasting Corporation of Niue, and one printed newspaper, the Niue Star. The first computers were Apple machines brought in by the University of the South Pacific Extension Centre around the early 80s. The Treasury Department first computerised their general ledger in 1986 using NEC personal computers which are IBM PC XT compatible. The Census of Households and Population in 1986 was the first to be processed using a personal computer with the assistance of the David Marshall, FAO Adviser on Agricultural Statistics, advising UNFPA Demographer Dr Lawrence Lewis and Niue Government Statistician Bill Vakaafi Motufoou to switch from using manual tabulation cards. In 1987 Statistics Niue got its new personal computer NEC PC AT use for processing the 1986 census data; Niue's personnel were sent on training in Japan and New Zealand to use the new computer. 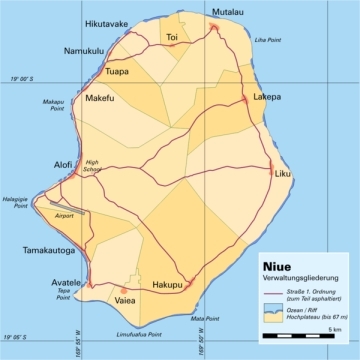 Niue's first Computer Policy was developed and adopted in 1988. In 2003, Niue became the first territory to offer free wireless internet to all its inhabitants. In August 2008 it has been reported that 100 percent of primary and high school students have what is known as a One Laptop Per Child, or OLPC, a green laptop designed specifically for children in the developing world. Arguably Niue's most prominent artist and writer is John Pule. Author of The Shark That Ate the Sun, he also paints, both on canvas and on traditional tapa cloth. Taoga Niue is a newly established Government Department responsible for the preservation of the culture, tradition and heritage of Niue. Recognising its importance, the Government has added Taoga Niue as the sixth pillar of the NISP. Agriculture is very important to the lifestyle of Niueans and the economy. Subsistence agriculture is very much part of Niue's agriculture, where nearly all the households have plantations of taro. Taro is a staple food, and the pink taro now dominant in the taro markets in New Zealand and Australia, is an intellectual property of Niue. This is one of the natural taro varieties on Niue, and has a strong resistance to pests. Tapioca or cassava, yams and kumaras also grow very well, as do different varieties of bananas. Copra, passion fruit and limes dominated exports in the 1970s, but in 2008 vanilla, noni and taro are Niue's main export crops. Coconut crab is also part of the food chain; it lives in the forest and coastal areas. The last Agricultural Census was in 1989 http://www.fao.org/ES/ess/census/wcares/Niue_1989.pdf. Despite Niue being a small country, a number of different sports are popular. Rugby union is a popular sport played both by men and women; Niue were the 2008 FORU Oceania Cup champions. Netball is played only by women. There is a nine-hole golf course at Fonuakula. There is a lawn bowling green under construction. Football is popular as evidenced by the Niue Soccer Tournament. Traditional sports includes tika, throwing slightly similar to javelin, and bowling coconuts for women.